To most people they do the same job. But honestly, seeing them this way is a mistake. The key to understanding the difference between an OKR and a KPI is to look firstly at what they are. A Key Performance Indicator (KPI) is a Quantitative Metric that is selected on the basis of its ability to inform how well a company, team, or individual is doing at any point in time. 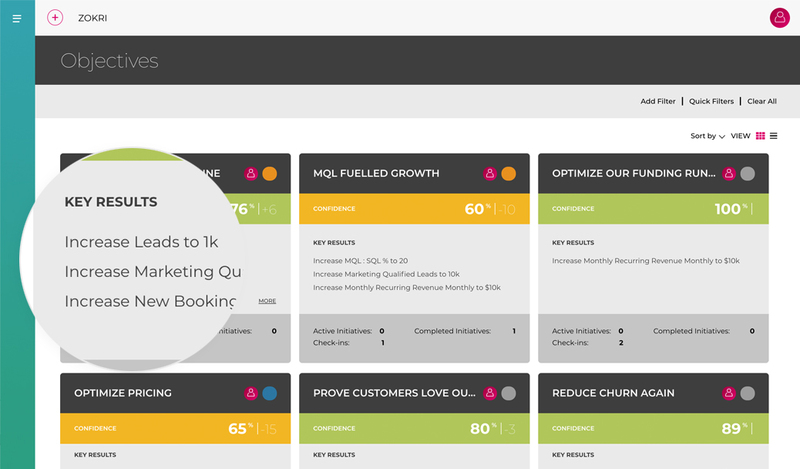 If you are in Marketing or Customer Success you’ll have your own sets of the KPIs. If you look at the above sets of metric that form the basis of the SaaS KPIs, you can immediately see how they’d be great at helping create better dashboard, do business diagnostics and strategy creation, as they would help direct areas of focus. For example: If Churn is too high and is bringing down the SaaS Quick ratio, and CAC : LTV, you’ll know the biggest threat to your SaaS business is Retention. If MQLs are not converting to SQLs very well, you know there’s a lead quality issue and Marketing and Sales need to align around your Ideal Customer Profile. If your CAC is too high and Lead Volume low, you’ve an issue with Acquisition and Marketing. This is why in we allow users to define and own metrics that can be added to Dashboards, but these are not Goals. What Are Goals And Why Do You Need Them? KPIs are metric that are statements of fact – for this metric you are here. This could be for a single point in time or through-time with change being highlighted. Create alignment and parent child relationships between Company, Team and Individual goals. Balanced Scorecard, 4DX (The 4 Disciplines of Execution)? The truth is all are better than not having Goals. But we see OKRs as a mature and proven goal setting framework, especially for SaaS, but its effectiveness is all verticals is unquestionable. Here’s a quick reminder of how you construct and OKR. An OKR consist of a Goal Statement e.g. Become the Market Leader or Optimize your Sales Pipeline, and a set of 1 – 5 Goal Metrics that would allow you judge the success or failure of your goal. You can see more OKR examples here. Time-span: OKRs have a start and end date and can roll-over from Period to Period e.g. Quarters with target metrics varying, or be tactical and used for a limited amount of time. You can see from that how that means they are different to KPIs but often share the Metric component. So the reality is that you don’t choose whether you use KPIs or OKRs. You use both. You use KPIs for Dashboards, when doing diagnostics and strategy creation, and when telling the story of your company to 3rd Parties e.g. fund raising, and in internal meetings. You use OKRs as a framework to improve KPIs, to allow people to focus on the highest priority KPIs for your company, team, or personal goals. You also use OKRs as they have all of the other required performance boosting aspects outlined above and will have a greater impact of company performance.